With its playful print, this blouse is so very feminine. The blouse has three-quarter sleeves, button closure at the front with a collar. 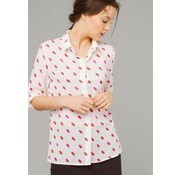 The fabric is lightly transparent with a red and pink lips print. So kissable!